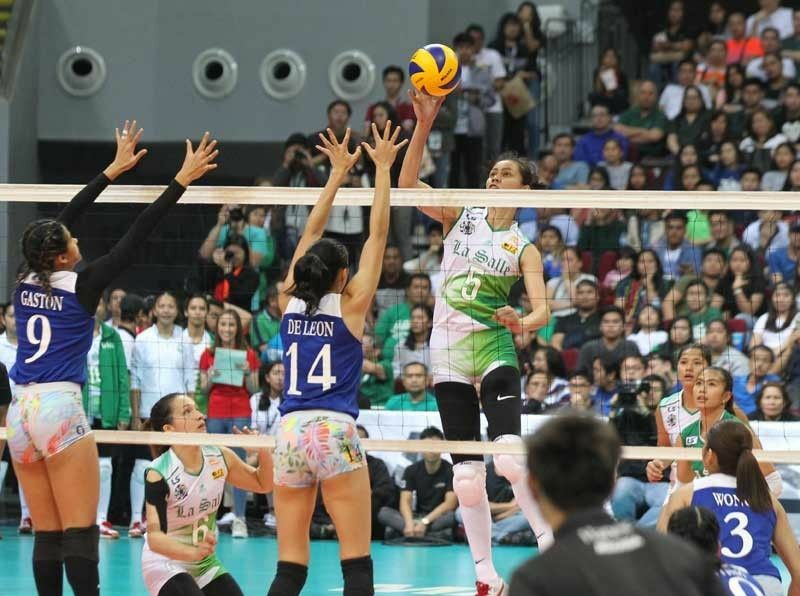 The Lady Spikers blanked the Lady Eagles at the net, neutralizing the strength of the top blocking team to secure their ninth win against three losses and join their foe in the Final Four. MANILA, Philippines — Four-peat seeking La Salle sent soaring Ateneo crashing back to earth, 25-17, 25-13, 25-23, snapping its fierce rival’s hot 10-game win run to earn a spot in the semis of the UAAP season 81 women’s volleyball yesterday. DLSU asserted its mastery over ADMU which it defeated in their opening game, 25-14, 25-17, 16-25, 25-19, last Feb. 17. “I didn’t expect that the game would finish this fast. The players played well today,” said Lady Spikers coach Ramil de Jesus of their 82-minute victory that earned them their 11th straight post-season appearance. ADMU, coming off a 10-game win roll, struggled against its archrival, fading halfway in the first set as May Luna powered DLSU’s pullaway from an earlier one-point game, 14-13. The Lady Eagles found no answer against the surging Lady Spikers, producing measly three attacks in the second and drawing the rest of their output in the frame from their opponent’s 10 errors. Though ADMU tried to put up a fight in the third, DLSU weathered its repeated charge, leaning on middle blockers Des Clemente and Aduke Ogunsanya to complete the straight sets win. “We just remained disciplined from the very start of the set. We instilled in our minds what coach (Ramil de Jesus) told us: that we needed to be focused and disciplined. We know that the win won’t come easy,” said Lady Spikers libero CJ Saga, who produced 21 digs and 14 excellent receptions.